Which plants will survive droughts, climate change? New research by UCLA life scientists could lead to predictions of which plant species will escape extinction from climate change. Droughts are worsening around the world, posing a great challenge to plants in all ecosystems, said Lawren Sack, a UCLA professor of ecology and evolutionary biology and senior author of the research. Scientists have debated for more than a century how to predict which species are most vulnerable. Sack and two members of his laboratory have made a fundamental discovery that resolves this debate and allows for the prediction of how diverse plant species and vegetation types worldwide will tolerate drought, which is critical given the threats posed by climate change, he said. The research is currently available in the online edition of Ecology Letters, a prestigious ecology journal, and will be published in an upcoming print edition. Why does a sunflower wilt and dessicate quickly when the soil dries, while the native chaparral shrubs of California survive long dry seasons with their evergreen leaves? Since there are many mechanisms involved in determining the drought tolerance of plants, there has been vigorous debate among plant scientists over which trait is most important. The UCLA team, funded by the National Science Foundation, focused on a trait called "turgor loss point, which had never before been proven to predict drought tolerance across plant species and ecosystems. A fundamental difference between plants and animals is that plant cells are enclosed by cell walls while animal cells are not. To keep their cells functional, plants depend on "turgor pressure" — pressure produced in cells by internal salty water pushing against and holding up the cell walls. When leaves open their pores, or stomata, to capture carbon dioxide for photosynthesis, they lose a considerable amount of this water to evaporation. This dehydrates the cells, inducing a loss of pressure. During drought, the cell's water becomes harder to replace. The turgor loss point is reached when leaf cells get to a point at which their walls become flaccid; this cell-level loss of turgor causes the leaf to become limp and wilted, and the plant cannot grow, Sack said. 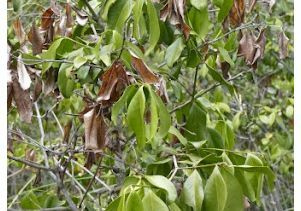 "Drying soil may cause a plant's cells to reach turgor loss point, and the plant will be faced with the choice of either closing its stomata and risking starvation or photosynthesizing with wilted leaves and risking damaging its cell walls and metabolic proteins," Sack said. "To be more drought-tolerant, the plant needs to change its turgor loss point so that its cells will be able to keep their turgor even when soil is dry." The biologists showed that within ecosystems and around the world, plants that are more drought-tolerant had lower turgor loss points; they could maintain their turgor despite drier soil. The team also resolved additional decades-old controversies, overturning the long-held assumptions of many scientists about the traits that determine turgor loss point and drought tolerance. Two traits related to plant cells have been thought to affect plants' turgor loss point and improve drought tolerance: Plants can make their cell walls stiffer or they can make their cells saltier by loading them with dissolved solutes. Many prominent scientists have leaned toward the "stiff cell wall" explanation because plants in dry zones around the globe tend to have small, tough leaves. 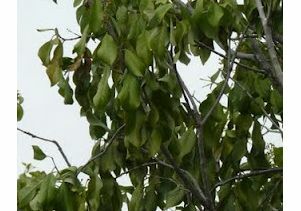 Stiff cell walls might allow the leaf to avoid wilting and to hold onto its water during dry times, scientists reasoned. Little had been known about the saltiness of cells for plants around the world. The UCLA team has now demonstrated conclusively that it is the saltiness of the cell sap that explains drought tolerance across species. Their first approach was mathematical; the team revisited the fundamental equations that govern wilting behavior and solved them for the first time. Their mathematical solution pointed to the importance of saltier cell sap. Saltier cell sap in each plant cell allows the plant to maintain turgor pressure during dry times and to continue photosynthesizing and growing as drought ensues. The equation showed that thick cell walls do not contribute directly to preventing wilting, although they provide indirect benefits that can be important in some cases — protection from excessive cell shrinking and from damage due to the elements or insects and mammals. The team also collected for the first time drought-tolerance trait data for species worldwide, which confirmed their result. Across species within geographic areas and across the globe, drought tolerance was correlated with the saltiness of the cell sap and not with the stiffness of cell walls. In fact, species with stiff cell walls were found not only in arid zones but also in wet systems like rainforests, because here too, evolution favors long-lived leaves protected from damage. The pinpointing of cell saltiness as the main driver of drought tolerance cleared away major controversies, and it opens the way to predictions of which species could escape extinction from climate change, Sack said. "The salt concentrated in cells holds on to water more tightly and directly allows plants to maintain turgor during drought," said research co-author Christine Scoffoni, a UCLA doctoral student in the department of ecology and evolutionary biology. The role of the stiff cell wall was more elusive. "We were surprised to see that having a stiffer cell wall actually reduced drought tolerance slightly — contrary to received wisdom — but that many drought-tolerant plants with lots of salt also had stiff cell walls," said lead author Megan Bartlett, a UCLA graduate student in the department of ecology and evolutionary biology. This seeming contradiction is explained by the secondary need of drought-tolerant plants to protect their dehydrating cells from shrinking as they lose turgor pressure, the researchers said. "While a stiff wall doesn't maintain the cell turgor, it prevents the cells from shrinking as the turgor decreases and holds in water so that cells are still large and hydrated, even at turgor loss point," Bartlett explained. "So the ideal combination for a plant is to have a high solute concentration to keep turgor pressure and a stiff cell wall to prevent it from losing too much water and shrinking as the leaf water pressure drops. But even drought-sensitive plants often have thick cell walls because the tough leaves are also good protection against herbivores and everyday wear and tear." Even though the team showed that turgor loss point and salty cell sap have exceptional power to predict a plant's drought tolerance, some of the most famous and diverse desert plants — including cacti, yuccas and agaves — exhibit the opposite design, with many flexible-walled cells that hold dilute sap and would lose turgor rapidly, Sack said. "These succulents are actually terrible at tolerating drought, and instead they avoid it," he said. "Because much of their tissue is water storage cells, they can open their stomata minimally during the day or at night and survive with their stored water until it rains. Flexible cell walls help them release water to the rest of the plant." This new study showed that the saltiness of cells in plant leaves can explain where plants live and the kinds of plants that dominate ecosystems around the world. The team is working with collaborators at the Xishuangbanna Tropical Botanical Gardens in Yunnan, China, to develop a new method for rapidly measuring turgor loss point across a large number of species and make possible the critical assessment of drought tolerance for thousands of species for the first time. "We're excited to have such a powerful drought indicator that we can measure easily," Bartlett said. "We can apply this across entire ecosystems or plant families to see how plants have adapted to their environment and to develop better strategies for their conservation in the face of climate change." UCLA is California's largest university, with an enrollment of nearly 38,000 undergraduate and graduate students. The UCLA College of Letters and Science and the university's 11 professional schools feature renowned faculty and offer 337 degree programs and majors. UCLA is a national and international leader in the breadth and quality of its academic, research, health care, cultural, continuing education and athletic programs. Six alumni and five faculty have been awarded the Nobel Prize.